XU BEIHONG | Geringer Art, Ltd.
Xu Beihong was a Chinese painter born in Yixing, Jiangsu province. He is best known for his Chinese ink paintings of horses and birds which are infused with personal feeling. Xu Beihong is also widely recognized as the father of modern Chinese painting. 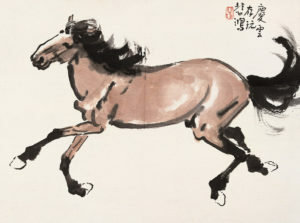 His reputation stems both from his innovative ink works—which helped revitalize the traditional Chinese ink painting—and for his hybridization of Western painting techniques. His style, which was influenced by Western realism, relied more on visual sources than the textual sources favored by ancient Chinese literati painters. Xu Beihong studied calligraphy and classical painting with his father Xu Dazhang beginning at the age of six. In 1915, he moved to Shanghai, where he made a living painting commissions and doing commercial art. In Shanghai, he met the scholar and political reformer Kang Youwei, who would become his mentor and would greatly influence his thinking about the need to integrate Western methods and subjects into Chinese art. In 1917 he traveled to Tokyo to study Japanse art and culture. Upon his return to China he taught at Peking University’s School of Art at the invitation of Cai Yuanpei (蔡元培). Beginning in 1919, Xu Beihong studied in Paris at the École Nationale Supérieure des Beaux-Arts, taking courses in oil painting and drawing and becoming one of the first Chinese painters trained in traditional European methods. During this period Xu became proficient in European style oil painting. He came back to China in 1927 and, between 1927 and 1929, taught at several institutions in China, including the National Central University (now Nanjing University) in the former capital city Nanjing. In 1933, Xu Beihong organized an exhibition of modern Chinese painting that traveled to France, Germany, Belgium, Italy and the Soviet Union. During World War II, Xu traveled in Southeast Asia, organizing shows in Singapore and India. The funds from these exhibitions went to Chinese people who were suffering as a result of the war. In late 1939, Rabindranath Tagore, a poet and writer who was also president of the Sino-Indian Cultural Society, invited the artist to hold exhibitions and give talks in India. Through Tagore, Xu met Mahatma Gandhi, whose portrait he sketched. In a March,1939 group exhibition, Xu showed his work alongside the Chinese painting masters Ren Bonian (任伯年) and Qi Baishi (齊白石) at the Victoria Memorial Hall. Many of Xu Beihong’s finest works were painting in the Himalayas. 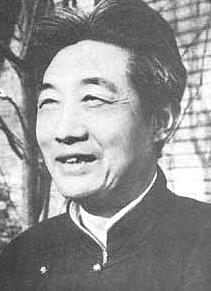 He resumed teaching in China in 1942, and after the war he served as the president of the Art College of Beijing. Xu Beihong died of a stroke in 1953. After his death, the Xu Beihong Memorial Museum was established at his home in Beijing. His wife, Liao Jingwen (廖靜文) served as the curator of the Museum until she passed away in June, 2015. His daughter Xu Liao Jingwen now serves as the museum’s director.